Another article this month looking back at how 2017 played out compared to previous years. This month I want to take a look at sales price to list price ratios. 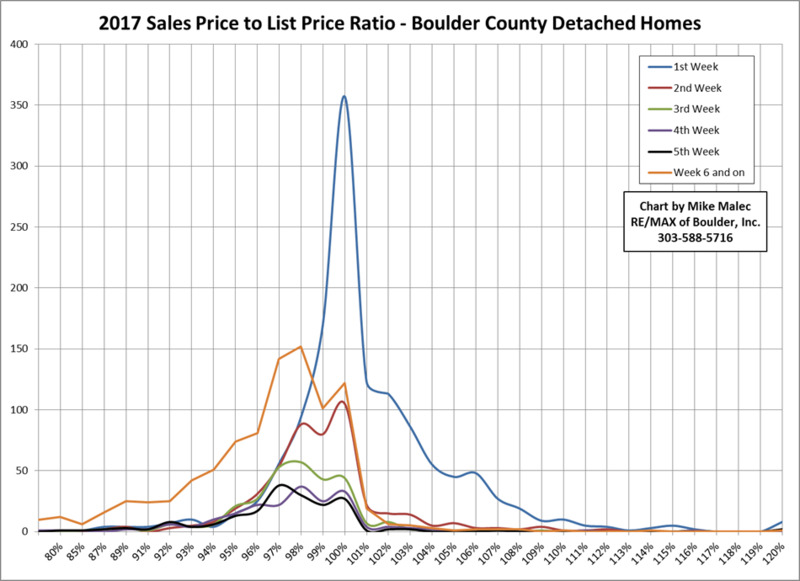 This year, as in previous years, I’ve removed seller concessions from the sales prices, hopefully making these sales price to list price ratios as accurate as possible using IRES only data for Boulder County. 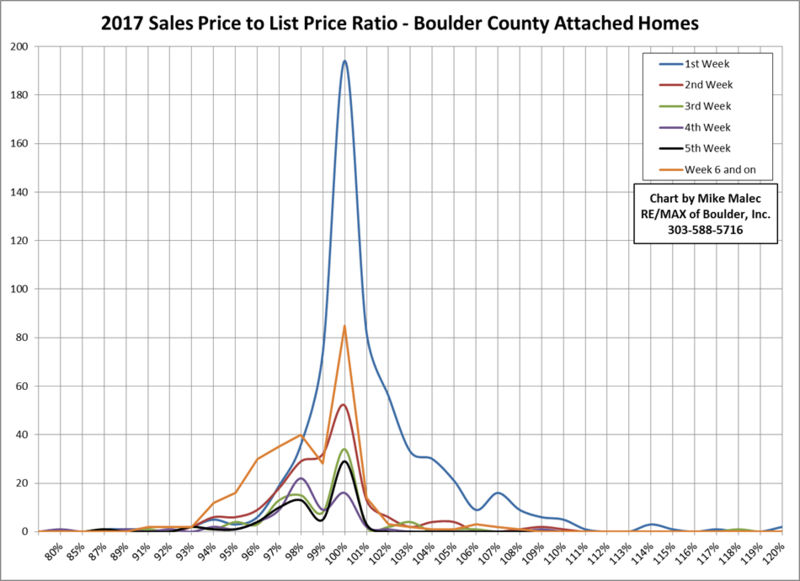 I first looked at the percent of the market that is selling for over asking price and how that metric is trending over time. In 2017, the percentage of both Single Family and Attached Homes selling for over asking price moderated and dropped from the 2016 levels. Just under 50% of Single Family Homes sold for over asking while Attached Homes saw just under 65% sell for over asking. This was a decline of 7-8 percentage points from the levels we saw in 2016. More importantly, this is the second year we’ve seen this metric decline for Attached Homes and both metrics are now declining likely indicating that we’re entering a new downward trend pattern. The second stat I wanted to revisit again was the sales price to asking price ratios and how those ratios change depending on how quickly the home goes under contract. As you would expect, the more quickly the home gets snatched up, the more likely the sales price was to be at or over the asking price, but we saw that trend moderating some in 2017. For Single Family Homes that went under contract during their first week on the market, just under 70% sold for at or over their asking price. This was a decline of about 6 percentage points from the levels we saw in 2016. We also saw about 6% fewer homes sell during their first week on the market and increases in the numbers of homes selling during the third week and on, another indicator of softening in these stats. The one quirk to this IRES data that I haven’t been able to eliminate is the possible inclusion of properties that were withdrawn and then re-entered with a new MLS # and possible new asking price that then sell quickly even though they have a lengthy combined days on market. In this graph, I’ve plotted, in separate colors, the Single Family home sales per the week they went under contract. The expected strength in the properties that went under contract in the first week is displayed in blue. As we saw in 2015 & 2016, those “under contract in the first week” properties had numerous sales that were at asking price through sales that were up to 10% over asking price. It’s not until homes have been for sale into the third week that you start to see the peaks in the chart at something less than asking price. One other quirk in the data that I didn’t attempt to adjust for was properties that went under contract, had a buyer back out and then re-entered the market. If we look at these same stats for Attached Homes, you’ll see that this market segment is also softening compared to last year but remains stronger than Single Family. Attached Homes that went under contract within the first week on the market sold for asking price or better 76.01% of the time, more than 10 percentage points lower than 2016. During 2016 more than half of the Attached homes went under contract in the first week and last year that number dropped about 5 percentage points to just under 47%. As we saw in 2016, there is far more strength for close to or at asking price sales in Attached Homes past the first week on the market than we see for Single Family Homes. For some reason about half of all Attached Homes sell for asking price or better after the first week except for those homes that go under contract in week 4. Hard to tease a reason for this out of the data, could be overall lower prices for Attached homes, odd price reduction effects, or more demand for that entry-level, affordable price point. Interestingly, all of these 2017 metrics show softening since 2016 and yet the subjective feel of the market so far in 2018 is a strengthening market with many properties that lagged on the 2017 market suddenly getting snatched up. Hard to tell which signal to trust as we move further into the year. Could be that the strength we’re feeling is due to very small numbers of available homes and I can see that lack of available inventory continuing throughout the year. Could be that the softening may accelerate if mortgage rates continue to creep upwards. Only time will tell.